Here is a perfect baby shower centerpiece. 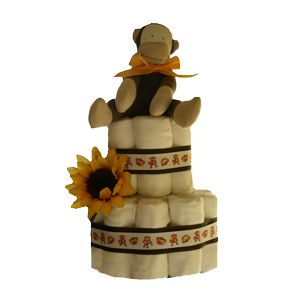 Crafted with 2 tiers of Organic Cloth Diapers by Gerber this diaper cake makes an attractive baby shower centerpiece and a unique baby gift for parents expecting a baby boy or baby girl. This is a GrowInStyle Exclusive Design. © 2010. All rights reserved.